On Sunday we took a Shinkansen from Odawara to Tokyo to meet up with Sam’s family. Both her sisters and their husbands joined us as well as her mother and her brother-in-law’s mother for the rest of the trip. 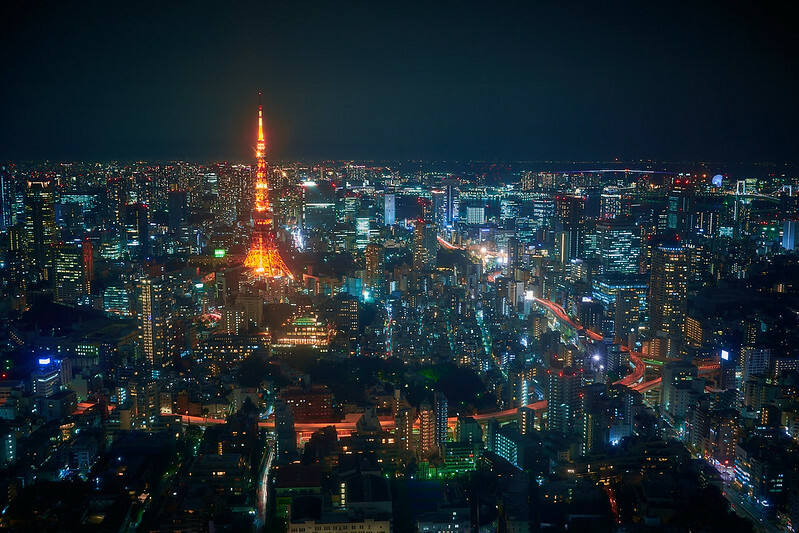 Her sister booked us all rooms in the Shinjuku Prince hotel, a high-rise not far from the subway station and across the street from the bustling core of Shinjuku – the densest part of Japan. After the family assembled in late afternoon we took the subway across town to the Thunder Gate. 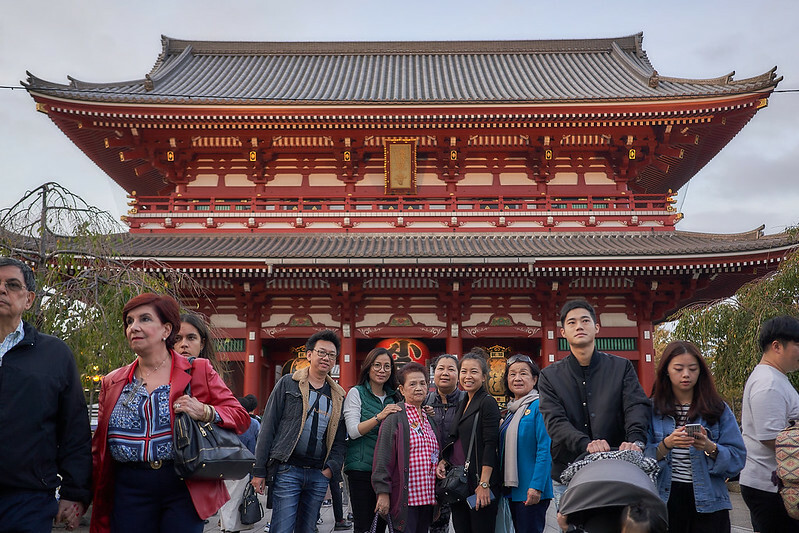 “Who cares about your family photo, I need to walk around with my eyes glued to my phone in this sacred shrine!” was a familiar refrain heard all across Tokyo on our trip. 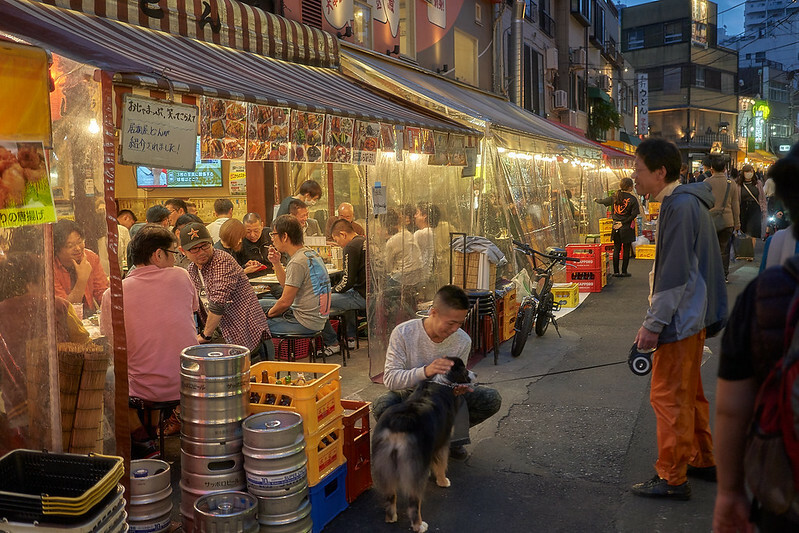 We looked around at the Shrine and walked over to the infamous Hoppy Street, eating street food. Folks in this picture are excited about the dog because dogs are actually rarely seen in public in Japanese cities. Stray ones are “taken care of” quickly and strict rules (like gun legislation in Japan) apply to ownership so only responsible people are allowed to have that sort of property and only reasonable (like guns) types of pets are allowed to be sold/kept. This ensures (like guns) that accidents rarely happen and the community (and animals) are kept safe and healthy (unlike how America legislates guns). 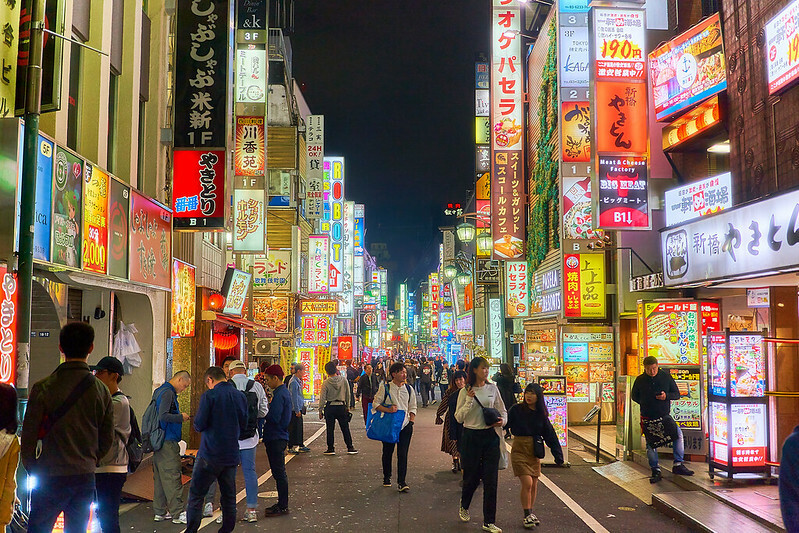 After going back to the hotel, a smaller group left again to wander Shinjuku at night in search of yakitori. 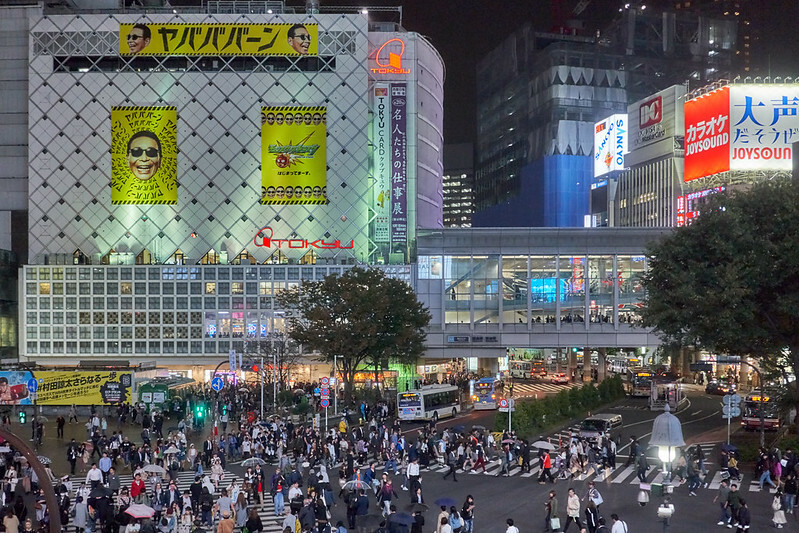 A surprising lack of digital signage for the hippest neighborhood in Japan. 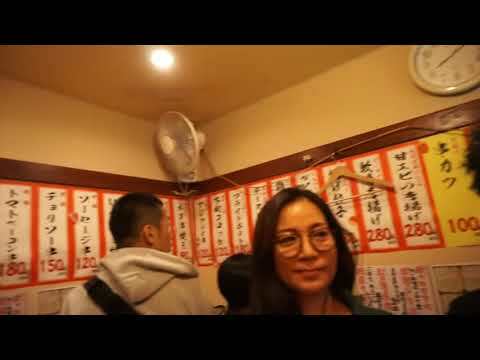 We found a local standing-room-only yakitori bar and ended up inhaling more cigarette smoke than meat due to the slow service. Cigarettes occupy a strange space in Japan. They are a society extremely observant of public smoking, with large signs affixed to the sidewalks in many cities banning the behavior. Because of this the streets are clean (which means the rivers and oceans they drain to are clean), but as soon as you duck into a bar… cough cough cough, the smoke hits you like wave. I guess the theory is that it’s your choice to enter a restaurant, but not your choice to enter a public street. Makes sense, though I wish there were more restaurants that banned cigarettes completely like many states in America have been doing. I felt like my lungs got really unhealthy at the same time my stomach was eating really healthy. In the morning the family headed out “for breakfast” and boarded a shinkansen to Kawaguchi Station. 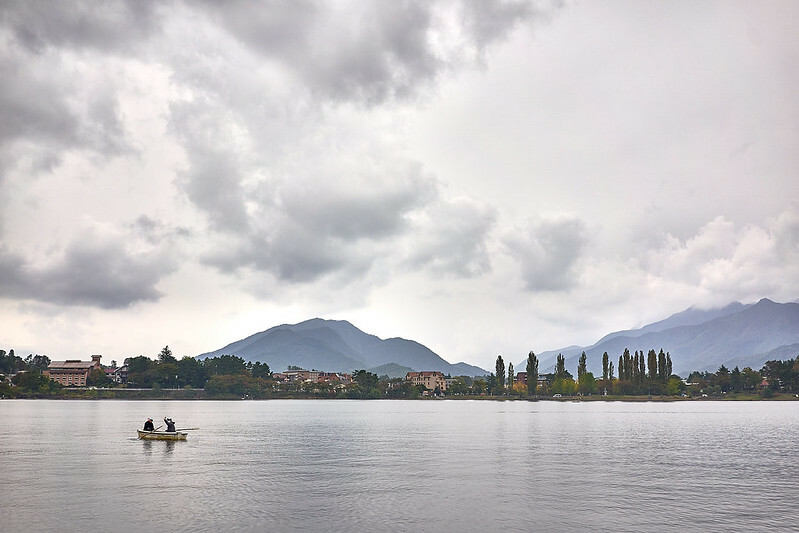 We walked down through the town to Lake Kawaguchi and took a boat cruise in the rain to the Fuji viewpoint. I wonder if that infrared Hasselblad could see Fuji through those clouds. Would be cheaper to live in Tokyo for six months than to buy that camera, though. As our innkeeper in Hakone had warned two days ago, the fog still covered the slopes and Fuji-san eluded us. We trodded back to the station and took two slow local trains back to Tokyo, arriving after dark. After spending some time in the station reserving our seats on the shinkansen to Hakodate for the following morning we split up. Sam and I went to Shibuya. Me for the famous crossing. And Sam for the famous Ichiran Shibuya Ramen. It’s a 45 minute wait for a bowl of $15 Ramen. On the other hand, the individual booths where waiters can’t even see you are a social anxiety/introverts meal-eating dream come true. The ramen restaurant is in a very tight underground short corridor of barstool style individual tables separated by partitions. You order at a machine after entering the antechamber after a long wait on the stairs which often backs up onto the street. Each meal stall has a forward wall partially made of bamboo that opens to the kitchen, though not high enough to actually see your server. The ramen itself was good, for ramen, but not worth the extreme markup in price over the ramen we all had in college and the similar markup in wait (3 minutes in the microwave vs. 45 in line). As the rain kept falling we took the Oedo Line to Roppongi Hills to visit the sky view of Tokyo with the famous view of the Eiffel-ish Tokyo Tower. In my mind the tower is red at night (because it is during the day) and I thought the orange was because we were there near Halloween (the Japanese go crazier for Halloween than we do, btw!). Turns out it’s always orange.